The problem of following certain recipes is that some called for seeds and others powder such as cumin seeds or in powder form. Which would you buy? I bought both for the simple reason that I forgot having the seeds form in the first place. If I know, will I grind my own? Will you? Pretty sure I will if I have an affordable and practical tool to do it. Which leads to – What is the BEST spice grinder? Surely, you will want to know. Read on to discover. Also, find out the benefits of grinding your own spices and some tips on grinding. You know this. It is meant for pepper, any types of peppercorn. Reading on blogs and forums, I found out that a pepper mill can be used to grind cumin seeds, coriander seeds, flax seeds, dried garlic or onions and dried chilli flakes. Will you use a pepper mill to grind these spices? As I use black pepper more often than these, it is not practical for me to switch the various spices with the black peppercorns. Unless I have an extra unit, which I don’t. If you do and intend to use it, there is one thing that you should not use it for grinding. SALT! Salt and pepper mills are sold separately and there is a valid reason why. The grinding mechanism of the salt mill is made of ceramic while the pepper mill uses carbon steel, which salt corrodes. This is an ancient tool that dates back to approximately 35,000 B.C. This works fine if the spices are in a small amount. What if you need a little bit more especially when making your own spice rub for a whole chicken or beef brisket? How long would you be grinding, manually? Some food processors have spice grinder attachments. Contrary to the mortar and pestle, it will do a good job of grinding spices in a bigger amount. But it is not feasible to lug out a bulky device just to grind the teeny weeny bits of spices. There is an advantage of grinding on an as-needed basis. I will explain the benefits of doing so. Read on. This is an electrical device used to grind whole spices which are dried and usually hard. Depending on your needs, you can grind them to a fine powder or coarsely. Basically, most spice grinders are also coffee grinders. Unless you don’t mind having a cumin-scented coffee, you may use it for both. NO! Please don’t because it will be the worst coffee ever. For me, it is. What do you think? I love cinnamon coffee though. Interestingly, I found a recipe using both cumin and coffee! It is Cumin and Coffee Dry Rub for a salmon dish. Coming back to the spice grinder, it is highly advisable to have separate units for both coffee and spices to protect the quality of each. Using a spice grinder to grind coffee will alter the aroma of your coffee. Conversely, using a coffee grinder to grind your spices will taint it with coffee flavour because the coffee oil will permeate the interior of the grinder. Spices lose its quality and flavour swiftly once they are crushed. Hence, grinding your own ensure the maximum potency of the spices, giving your dish a bursting flavour. Grind the amount needed to avoid wastage. The shelf life of ground spices is six months while the whole is one year. You wouldn’t want to keep them for months, for the reason stated above. Do you know what is included in the store-bought ground spices? Salt, preservatives or flavour enhancers may be added to it. Grind and mix your own spices so you know what is in it. 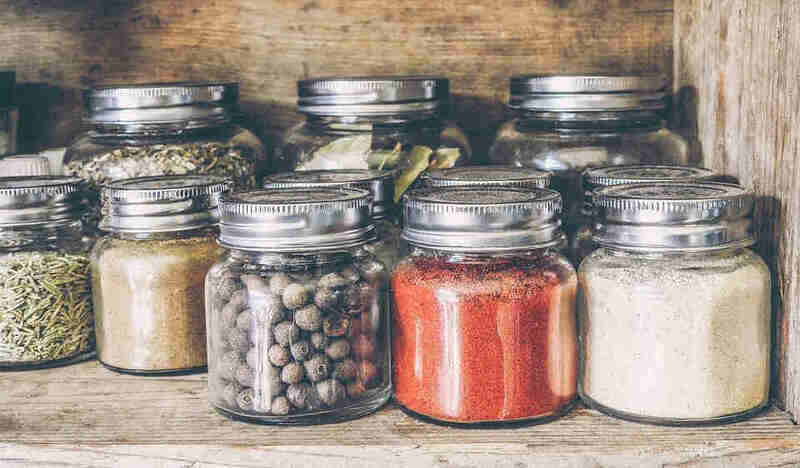 You don’t want to store bottles or jars of spices, whole and ground, leaving a cluttered pantry. Save your pantry storage space for something else – an electric Spice Grinder! Of the many spice grinders I have looked at, one that caught my eye was Secura Electric Coffee and Spice Grinder. A basic, small and handy device without the extra functions (dials and knobs) to complicate things. Easily removable grinding cup to make both emptying the ground spices and cleaning it less hassle. Ability to grind a wide range of spices from cinnamon sticks to star anise and cloves. And nuts too. Secura Electric Coffee and Spice Grinder fulfilled these 3 basic conditions. Stainless steel grinding cup and blades which are highly resistant to breaking, scraping and corroding. Not one but TWO interchangeable cups! 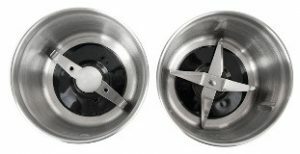 One cup has two blades which are meant for grinding spices and the other with four blades for chopping nut. Transparent lid to view the progress of the grind. You need NOT open the lid every now and then to check the progress and the desired fineness level. 200-watt motor and it has an advanced overheat protection technology to prolong its life. Simple push of the lid to operate the device with ease. Easily press the lid without much force. Safety lock prevents the grinder from operating when the lid is open. Cord wrap base to keep things neat and tidy. However, being small in size and basic as it is, this grinder does NOT have different settings for different kinds of grind. Therefore, you will have to pause to check the fineness level needed. This is where the transparent lid does its job. But then, you will still need to pause the device as it is advisable to pulse the grinder when grinding spices. I will tell you why in the tips section below. Let’s read on. The grinding cup is 3 inches tall and 3.5 inches in diameter with a holding capacity of 8 ounces (1 cup). It is ideal to grind for immediate use or two, about 3 ounces at any one time. If there is a bigger amount to grind, you can easily and quickly make a second batch in no time. You aren’t using a mortar and pestle. So, grind at ease. What do you think of this Secura Electric Coffee and Spice grinder? A good buy? Read my summary to help you decide. This grinder being small in size (4.5 inches diameter x 8 inches tall), is easily stored in the cupboard without taking much space yet stylish to leave it on the kitchen countertop. You won’t see dangling power cord because it winds up underneath the grinder. Since the grinding cup is detachable, it is so convenient to pour out the ground ingredients. Most importantly, cleaning is not a pain in the neck. No worries of water sipping into the motor housing. This will happen if the grinder is a whole unit. Imagine having to wipe down the device from top to bottom, inner to outer. The stainless steel grinding cup and blades ensure durability and prevent rust too. Combining these two features, detachable and stainless steel, you can safely put it in your dishwasher. With a 200-watt motor, it can grind a wide range of spices and nuts too. You can watch them being ground to the preferred fineness level through the transparent lid. Worried that the ingredients will accidentally “burst out” while grinding? It will not because the device has a safety lock thus won’t operate when the lid is open. Sum up the above, plus an affordable price with a 1-year warranty, this is a pretty good buy. Toast your spices. Dry toasting the spices will release the oil and intensify their flavour. Toast them in a small, heavy fry pan over medium heat. Stir constantly till fragrant. Pour them out immediately into a bowl and stir them to release the heat. Ensure the spices are totally cool before grinding. Pulse your spices. When you are grinding the spices, pulse the device rather than leaving it on till the spices reach your preferred fineness level. Pulsing the device will keep the blade from overheating which can leach away the flavour from your spices. Caution: Do NOT grind whole cinnamon sticks. Contrary to some customers comments stating “Yes, you can grind cinnamon too”, a 200-watt grinder will not be able to do so. But, not that you can’t. Simply break the cinnamon stick into smaller pieces before grinding. You will get beautiful finely ground cinnamon. Can you smell them already? Clean your grinder. Keep the grinder clean to avoid mixing ingredients and crossover of flavours or aromas. Grind a couple teaspoons of white rice or rock salt or a piece of bread to deep clean your spice grinder. Rock salt helps to remove stubborn ingredients while white rice and bread help to absorb leftover oil from spices while eliminating the smell. Hope the benefits of grinding your own spices that I have shared with you will convince you to own one. 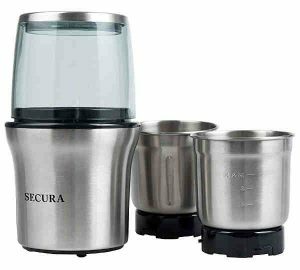 Does this Secura Electric Coffee and Spice Grinder suit your needs? If yes, buy now! When you have received your grinder, try grinding some aromatic spices, like cinnamon or cloves. You will be amazed by the aroma that fills your home. What is the best spice grinder for you? 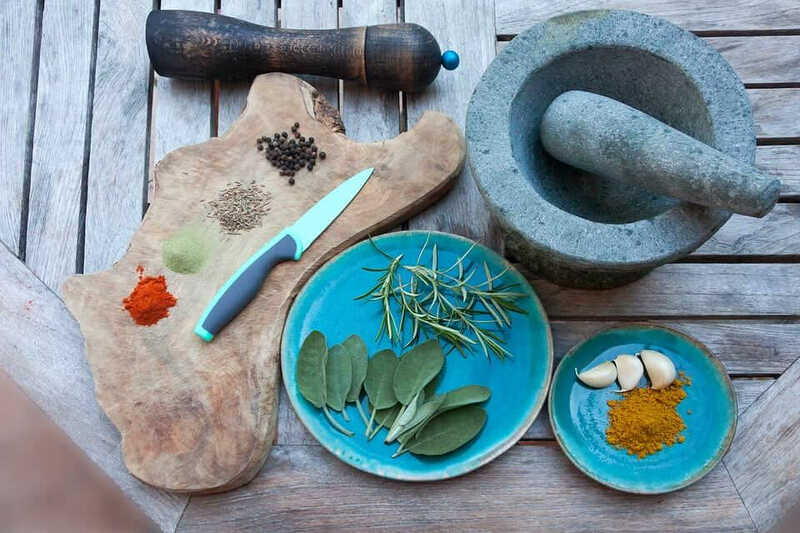 Do you prefer a mortar and pestle or would you agree that an electric spice grinder is one of the essential tools that we should have in each and every kitchen? I say yes. Well, at least for those who often cooks at home. Share your opinion with us in the comment section below. Or share your favourite spice blend. 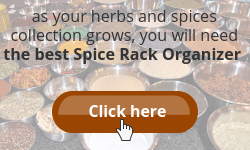 If it is time to declutter your spice cabinet, click here to find the BEST Spice Rack Organizer that suit your needs. I love to use fresh herbs and spices when I have the opportunity to cook. I usually just do a rough chop or mash with my knife. The grinder that you discussed looks like a much better idea! Especially if you want a larger quantity of herbs and spices. Thank you for the great information. You are most welcome Valerie. 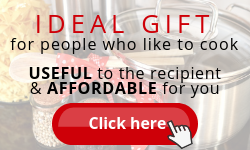 I am sure you will enhance and enjoy your cooking experience with the help of a spice grinder. Great, you have indeed educated me today on the need to grind my own spices, In fact I never knew that the shelf life for ground spices is six months while the whole is one year. Thanks for that info. I never thought that the spices sold out there may contain some for of preservative that makes them last long, and I think that is never the best. As you said, the best option is to grind my own spice. Also I want you to know that I appreciate you letting me know that it may not be good to use the same spice grinder for my coffee mixture and vice versa. I will surely try to purchase, a separate one for my coffee mixture and one for grinding my spices. 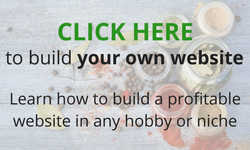 I am glad this article has given you much information to make a sound decision on buying spices as well as the grinder. Hi Sharon Thanks for the information on the spice grinder. I have in the past dried my herbs in a dehydrator and then ground them up. I never realized the difference in the shelf life prior to grinding. I have used the Magic Bullet to grind up my herbs when dried. It works pretty good especially since it has the pulse feature to grind. Problem is though I do use it for other things and did not realize how the oils etc can be left behind on the blades. Might be time to invest in a grinder just for spices. Thanks for visiting. 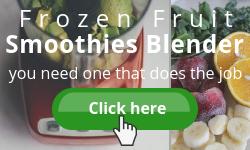 Magic Bullet is indeed one of the most essential device in the kitchen. If budget permits, do invest in a spices only grinder, to avoid crossover of flavours. ohhh this is just in time! I’ve just recently moved to the mountains and still finding my way to “naturalize” my habits, my home, my life… 🙂 you gave me awesome ideas with his article and so much information too! going to make a list of spices and herbs I want to grow and grind by myself now! Congratulations! It is a good move. Mountain breeze every day. Wish you all the BEST! 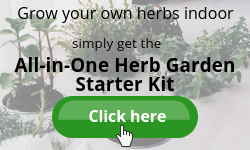 Do drop by in the near future for more ideas on how to use herbs and spices. Several months ago I took a liking to cooking. I had never expected it could happen to me as I the idea of spending too much time in kitchen had never been appealing to me. The spice grinder seems to be one of these things. Judging by your review, I like pretty much everything about it. I have a question, though. Do YOU use (or plan to use it) in your kitchen? If so, what is your personal experience with it? Hi there. Thanks for dropping by. I wanted to buy a spice grinder and this lead me to survey a few choices. 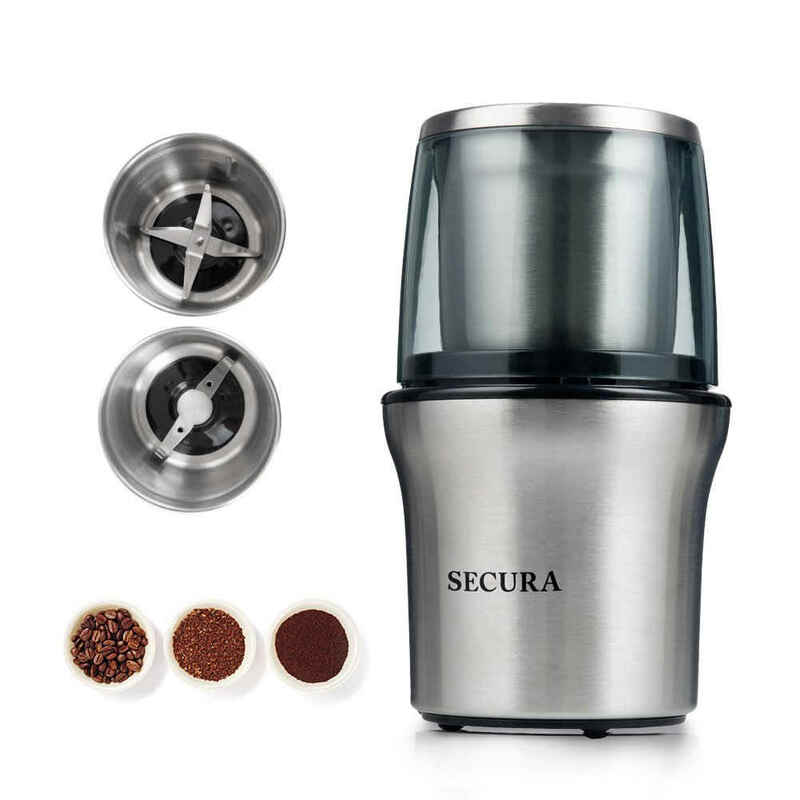 My top pick was Secura Electric Coffee and Spice Grinder as it met my criteria. It was very unfortunate that the price in my country is 4x more!! Totally out of my budget. Hope that my review will benefit readers in choosing the best for themselves. Meanwhile, I shall continue my search. Hi, came across your spice grinder review. I knew that the mortar and pestle was an old invention, but 35,000BC or so?! Holy cow! Anyway, I’ve always been a fan of the old-school method of mortarin’ and pestlin’, so I’ll mostly stick with that, but there are a few things that this spice grinder could help with… Thanks for writing the review! You are most welcome. Thanks for dropping by. My mortar and pestle was passed down from my grandmother. This is the 3rd generation in use. Still in excellent condition. I always prefer fresh ground coffee to the pre ground mass produced stuff, so why not spices. It never occurred to me until I read you post. Thanks for the insight on toasting. I’ve never tried that but certainly will now. As for the Epica, I love mine and will order a second for spices! Thanks for dropping by Marc. Grinding our own coffee and spices definitely have its advantages. Hi, Sharon! Thanks for the great review. I never even thought to have a spice grinder, but it seems like a great gadget to have in your kitchen. I really like how you not only reviewed this product, but also gave tips on how to get the most out of it as well. You are most welcome Jade. Do consider to get one for yourself or as a gift. It does make an excellent gift. Oh my gosh, you are so right. I have the smallest mortar and pestle in the whole world. Grinding up large amounts of herbs together is such a daunting task. The size worked great when I limited space where I used to live, but now I’m just struggling! This electric spice grinder looks super great. Thanks for the review! Do get one soon Helen. It makes the grinding task much easier. Thanks for this detailed post on grinding spices. I never knew that there are electric grinders on the market but I am glad to know there are. Grinding your own spices makes a lot of sense, especially when you consider the flavor you will get. I recently threw away most of my spices as they were all old and were past the date they should be used by. It seems like I spend a lot of money on spices and then must throw them away since I have not used much of them. I also appreciate your tips on how to grind your spices, this is information I did not know. The grinder that you talk about seems safe and is a nice looking appliance. Thanks for dropping by Erin. And taking time to comment. I will be writing more on ways to use herbs and spices. Do visit again periodically. Enjoyed reading your spicy article and your suggestion. I was sure you were going to settle for the mortar & pestle grinder, as it is such a traditional spice tool, but the spice grinder you suggested at the end really sounds great! Do you think they sell more interchangeable cups – so you could have one for your coffee and another for your spices (that way you don’t get cumin taste coffee! That’s a good idea, Orion. Secura sells the cups separately but it is in a pair. You will have to buy the grinder and chopper bowl together. I have the mortar and pestle, of sentimental value, handed down from my grandmother. An electric spice grinder would be a great tool to have. Hi Sharon, great post! I like the idea of getting a spice grinder and buying or growing? whole spices to grind. I really like your idea to grind bread or rock salt to thoroughly clean the grinder. Thanks for that tip! You are most welcome, Tara, Glad that this article is of help. 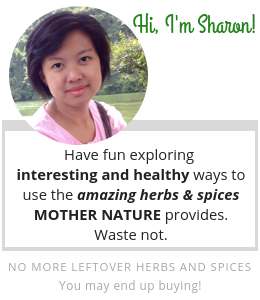 Hello Sharon, Again, you did it.. another great article.. so knowing we can grind our own spices, after growing them certainly makes me feel like the intention of goodness is so prevalent. WE don’t have to worry about pesticides or any toxins as we then control the environment. I did not know there was a specialized spice grinder. HOw very cool! It is good to have a tool to lighten our task. As a mom who cooks almost every day, I understand how it feels when we are overwhelmed by all the household chores. Therefore, we need tools to help us. Should you intend to get one for yourself, check out the latest price here. Thanks for dropping by often.